Research and text by Rebecca Kalinowski and Pam VanderPloeg, copyright West Michigan Modern, 2016. 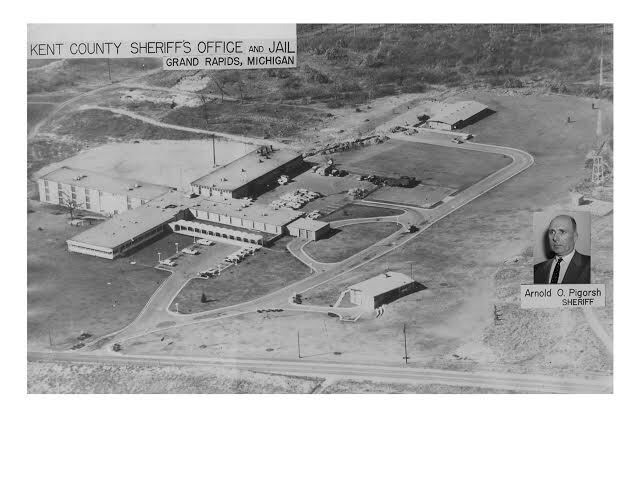 Black and white photos provided by the Kent County Sheriff's Office. Grand Rapids Press Photos, Saturday, January 4, 1958. Isn't it always the case that when you go searching for one thing, you find something else? I wanted more information about how the Kent County Jail came to be designed by Yamaski and Leinweber of Detroit in 1958 with Grand Rapids firm Obyron and Knapp acting as associate architects. Instead I discovered that E. John Knapp designed a house right across from the jail for the Sheriff, Arnold Pigorsh, and his family. Aerial view of the jail with the Sheriff's house in the foreground. Photograph courtesy of the Kent County Sheriff's Office. Knapp designed the kitchen with birch cabinets that separated kitchen from the dining area. Dining and living areas were contained in one wing while sleeping quarters were located in a separate area. Said Knapp, "Ceilings and walls are all white and all of the wood is natural birch.” He also mentioned the abundance of closets and declared that "it is the only house in Grand Rapids built entirely by union labor." The Sheriff's House under construction. Photograph courtesy of the Kent County Sheriff's Office. The house was furnished by Business Interiors of Grand Rapids for a price of $7,389 and that included draperies and carpeting. The Grand Rapids Press article shared that jail officials emphasized that they were very budget conscious, however, they had to build the house big enough to accommodate future sheriffs' families who might require more or less space. Several building committee members questioned the total construction price. One member stated that the house was better than his own. When WMM researcher Kalinowski realized it had long ago been torn down, she immediately contacted Sheriff Stelma's office to see if they had any old photos of the house. They responded right away, sending black and white photos of the house under construction and an aerial view of the jail showing the home's location. They told us that the house was lived in from 1955-1975, then the next sheriff, Phillip J. Heffron, elected not to live in the house, settling instead for a housing stipend. What we call "The Sheriff's House” became a half-way house for youth offenders. Then there was a small fire, and the house was no longer used by the jail. It was torn down in the 1980s to make way for the next expansion. The stylish modern living room in the Sheriff's House. Grand Rapids Press, January 4, 1958. We then contacted E. John Knapp, who is approaching his 100 year birthday and he remembered the house well and said he really liked Sheriff Arnold Pigorsh and remembered how he had pushed for the separate house for his family's privacy. When Kalinowski contacted Pigorsh's daughter Berdeen, she expressed regret that the house had been torn down. She recalled being 23 years old when they moved into the new house in 1958. It was a complete contrast to their old house, attached to the jail, where you entered right from the front door into the turnstile for the jail. She loved the new house and said it was light and airy with huge windows and beautiful views. This was before the I-196 expressway was built, and Berdeen said the country stretched out in all directions. She also remembered the Danish modern furniture; it was light but comfortable. Notice the modern hanging lamp over the dining table, the post and beam construction and the accordion screen that can be used to separate the living room and dining area. The kitchen was very modern with nice appliances and a garbage disposal, which was something new for her. The kitchen opened to the dining room and living room with its enormous windows. It was carpeted throughout, which she specifically remembered because she always vacuumed it. The bedrooms were very small - barely enough room for two twin beds, but there was lots of storage. The house and jail kept Berdeen and her mother busy. There was always something going on. According to tradition, Berdeen's mother created all the menus for the inmates and ordered the food, which was prepared in the jail kitchen by other cooks. Berdeen also recalled the time when a small plane circled the house and made many attempts to land in their yard but finally had to fly on. Rebecca asked Berdeen if she was ever afraid living next door to the jail and she was incredulous, saying "No!" She was very used to this life as her father had been involved in law enforcement since she was 2 years old. Sheriff Piggish and his wife loved Kent County and its people. His daughter said, "My dad was a good man." Berdeen didn't remember all of the details but recalled that sometimes in the cold winter months, the Sheriff took in homeless people and provided food to eat and a place to sleep. This was likely in the time of the old jail. Berdeen also proudly shared that her father donated the money from speeches he gave all around town to establish the Honor Camp, an alternative program to keep young offenders out of jail. As a tribute to Sheriff Pigorsh at this retirement, the minutes from the June 30, 1966 Grand Rapids City Commission meeting state, "The retirement of Arnold O. Pigorsh as Sheriff of Kent County has left a void in the County Government that will be difficult indeed to fill." We also discovered that "The Sheriff's House" is linked toFaith Lutheran Church, a striking mid-century church also designed by E. John Knapp. About the time the jail was built, the new Faith Lutheran Church congregation was meeting in the basement of a school, and Arnold Pigorsh and his family were active members. Pigorsh recommended that Knapp to design the church based on his work on the house and jail. Several firms were considered and it was hard decision for the fledgling congregation to decide between the alternatives of building a big new church and going more conservative and donating more money to the poor. Berdeen remembers Pastor Bob Lingnell's words to the congregation "God wants us to create beauty,” and Knapp was chosen as architect and Faith Lutheran Church was built at 3-Mile and Fuller NE in Grand Rapids. Pigorsh also convinced the congregation that they needed a big basement in the church as a place for young people to enjoy so they wouldn't get in trouble. As we were meeting to put together the pieces of the story, Kalinowski received a return call from the current Sheriff Lawrence Stelma. She told Sheriff Stelma about Arnold Pigorsh's strong connection to Faith Lutheran Church. He in turn shared how Pigorsh, and his successor Sheriff Parsons, started the Forgotten Man Mission that provides an outreach ministry, from several churches in town, directly to the inmates in the Kent County Jail. And one last anecdote tells of the respect the men of Arnold Pigorsh's crew had for their chief. They honored Pigorsh by all coming with their families to a special Sunday morning service at Faith Lutheran Church arranged by Pastor Lignell. How wonderful it was that a routine search for information on the design of the Kent County Jail became the story of almost forgotten modern house designed for a popular Kent County Sheriff by architect E. John Knapp AIA.